Attempt to present OneView on Another whose view is not in the window hierarchy. Following is the sample code I created to show the problem. 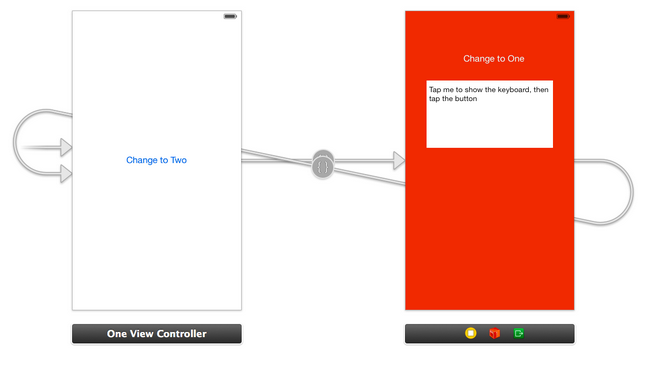 I have two ViewController: OneViewController and TwoViewController, and subclassed the UIStoryboardSegue class. Each view contains a button, triggering the segue moving to the other one. i.e., I want to move the destinationView from right to center. In the TwoViewController, I also have a UITextField. In the TwoViewController, the reason I wrote like this is because I want to hide the keyboard before performing the segue. start the app => tap "Change to Two" => tap the textfield to show the keyboard => tap "Change to One"(then the keyboard will hiding, after that, the view will change) => tap "Change to Tow" => tap the textfield to show the keyboard => tap "Change to One"
Warning: Attempt to present on whose view is not in the window hierarchy! And, if I repeat once more, I will get 2 warnings...Once more again, I will get 3...and so on.. In addition, if I remove the textfield, just two buttons, everything is fine. Browse other questions tagged ios objective-c or ask your own question.